Until Memorial Day this past weekend, I had never grilled a steak before, but it turns out I’m pretty decent at it. If you’ve never grilled anything before, it’s ok. I’ll help. I got some GREAT feedback about grilling from Facebook so I thought I would add it here for future reference. Marinate your steaks for 30 minutes or more. Don’t wait. Do it now. I used Dale’s. If you don’t have Dale’s… Bless your heart. Dr. Henderson, a great math professor and grillmaster that I aspire to be, told me on facebook that, “you might find that coarse kosher salt and coarse ground pepper is all that is needed.” And that is true as well. Oh, you’re not an Amazon Prime member, so you won’t get it in two days? That’s sad. You should become one. I’m a charcoal fan. I might be a fan of the convenience that propane grills have to offer later in life, but right now, I’m all about some charcoal. I recommend a bag of Kingsford, lighter fluid, and a long lighter, but this past weekend we used this type of charcoal that was natural and not packed into little squares. I was pretty hesitant about the whole thing but after we finally got it going, I really liked the natural type. It seemed to burn more evenly. Again, this is up to you. 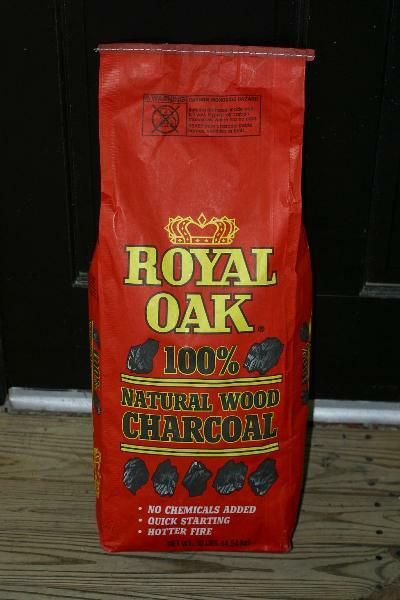 This past weekend I used Royal Oak and after talking with a Dr. Henderson, he said that it’s THE WAY to go with charcoal grilling so I’m going to stand beside that. …just put you some wadded up newspaper underneath, fill it with coals, and light the paper. it should light the bottom layer, and away it will go. btw, don’t put so much newspaper that it suffocates and not able to burn … there should be enough “air” under there to feed the newspaper fire. Once the charcoal is a nice white color, spread it out and get to cooking. Not my steaks, I stink at food photography. Someone help! What are these holes for on my grill? Those are to help control the temperature of the grill. If the holes are open, then the flames get oxygen; therefore, making it hotter. Science, guys! If you close the holes, then they get less oxygen – making the grill cooler. Whoo, I’m glad we got through that. How long should I grill my steaks? Here’s a really nifty calculator from the great HowtoGrillSteak website. My experience has shown that if your coals are nice and hot and if your steak is about and inch thick, then 4 minutes or so per side should get your to about medium rare, 5 minutes or so per side gets you to medium, 6 minutes per side gets you to medium well, and 8 minutes per side gets you to well done. 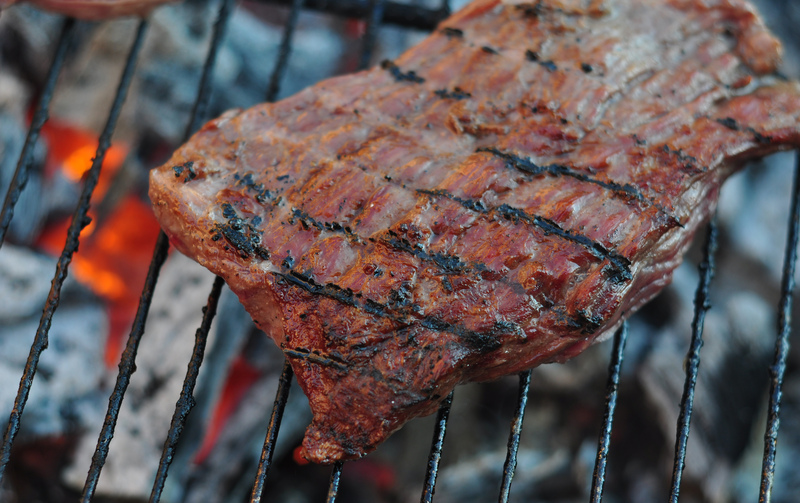 Time isn’t always a good metric to use in steak cooking as charcoal/spot heat can vary a lot. Poke the steak. Soft and squishy is rare, flexed muscle firmness is well done. The rare-er you want the steak, the hotter the fire needs to be. 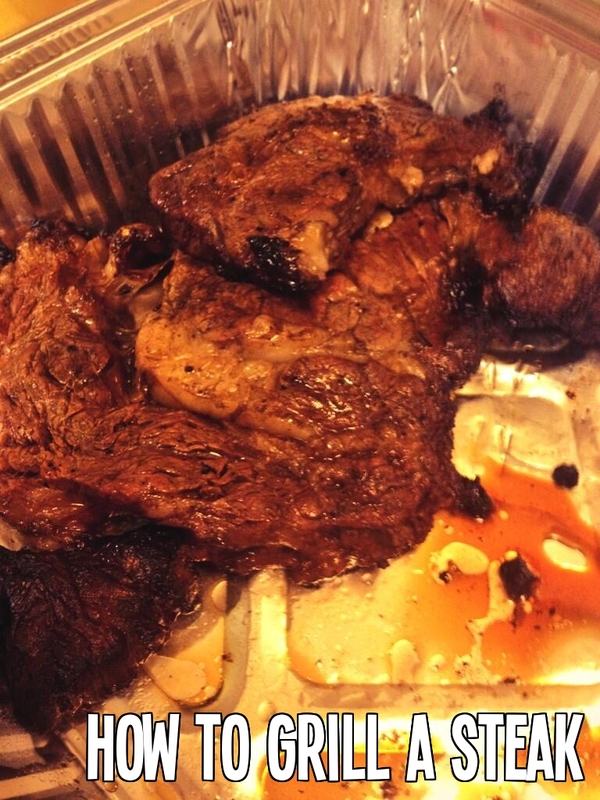 Steaks should be the same amount of doneness on the outside. If you want a rare steak you shouldn’t have to forfeit tasty, crispy char. And if you want well done, it shouldn’t have to be burned. I like rare to medium rare so my gas grill typically doesn’t get hot enough. Charcoal is the only way to go for me. Wipe the grill grates with olive oil just before throwing the steaks on. Makes for a really good, crispy sear on the grate lines. Whenever possible, flip your steak once. It really improves presentation. The steak continues to cook for about 5 minutes after you take it off the grill. If you take it off when it’s perfect, it will be slightly doner when served. Marbling = fat content within the meat. Looks like marble. The higher the amount of marbling the juicier the steak. Ribeyes have great marbling. Sirloin is a bit leaner so be careful on over cooking as they can get dried out much easier. As for the strip, don’t cut the fat off (if you’re one of those people) til AFTER the steak is cooked. The juices are your friend. What else can I grill? You could throw some corn on the kob in the husk on there, cook until burnt on the outside. You could also try other veggies like zucchini or squash. And of course, hamburgers and hot dogs. Silly kids. What’s stopping you? Go grill something!